The vision of Hands at Work is to see the local Church in Africa effectively caring for the most vulnerable, and unified in this mission with the Church outside Africa. The second part is just as vital as the first. Outside of Africa, support comes from churches, volunteers, advocates, prayer warriors, businesses and more. When people give, and give sacrificially, to the most vulnerable children in Africa, there is transformation happening on both sides: the giver and the receiver. And when people understand that they are blessed to be a blessing, they give freely. Daphne with a Care Worker in Oshoek, South AfricaIn Australia, Daphne has been a friend of Hands for over 10 years. She has supported our work and been a voice for the children of Africa in her community, even when she was often the sole voice. But her endurance has been honoured by God. Daphne came to Africa to serve with Hands on the Short Team Service Team in July 2013. 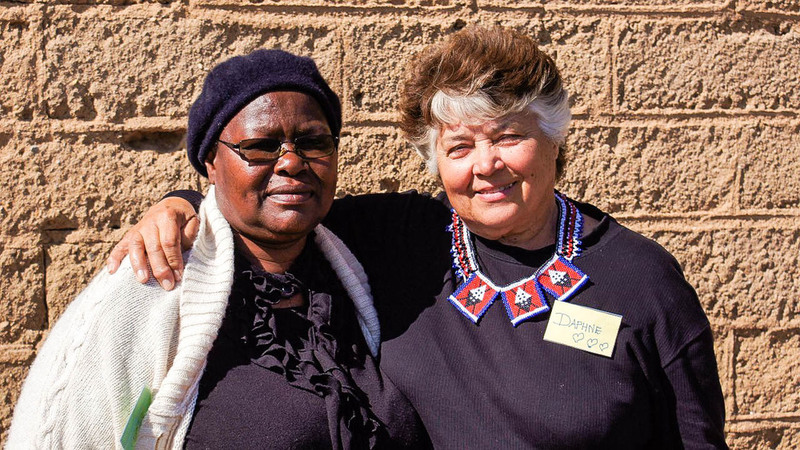 When she returned to her church in Perth, and having invited George Snyman to speak to her congregation, they began to support a community. Heart City Church is now supporting 25 children in Welverdiend, South Africa, with the hope to increase this number even further in the future. Heart City Church joins the Sunbury group, also from Australia, who support a further 75 children in Welverdiend at Pfunani Community Based Organisation. Heart City Church is now hoping to send their first team in September 2014 to experience Africa as Daphne has. We praise God for her dedication and His work in the hearts of so many people in Australia. We are often inspired by how one person’s story of Africa can create a ripple effect. In the US, Lauren Lee, who works as part of the Hands US International Office, shared her passion for the children of Africa with her friend Bill. Bill works for Microsoft and this company has a program where they will potentially match funding for charities. Lauren encouraged Bill to apply to this matching program and his application was successful! Bill contributed 5,000 USD and Microsoft matched this funding, allowing 10,000 USD to be donated to Hands at Work, specifically to the Malawi Service Centre! This support is an amazing example of how we can each use our influence and voice to advocate for the most vulnerable children. Jacob Erick with new friends in AfricaIn September 2010, Todd and Katie Wells served in the Democratic Republic of Congo for 7 months, living with Pastor Erick, our Hands at Work Congolese leader. As they returned to Canada, they knew their hearts would never be the same. When they gave birth to their son, they named him Jacob Erick, after the pastor whose life had inspired them. They also decided to raise funds for the community of Kitabataba in the Democratic Republic of Congo, where children were receiving home visits from Care Workers, but had no food security, access to education, or basic health care. In the beginning it was quite difficult. People who had not been to Africa did not understand the level of urgency. But in His mighty faithfulness, God gave Todd and Katie the strength to persevere, and they secured support for 50 children. In September 2013, Todd and Katie returned to the Congo and visited Kitabataba where they witnessed the transformation that has happened over the past couple of years. They could see the part that their support had played, but what impacted them more deeply was seeing the servant hearts of the Care Workers who had become like parents to the 50 children of Nyota Community Based Organisation. They could see Erick’s influence everywhere as the Care Workers displayed his same compassion and love. Also, Erick had the opportunity to meet baby Jacob in Zambia for the first time! Todd and Katie and their friends and family are now increasing the number of children they support to 75 children. This commitment requires sacrifice, but it is a sacrifice that is building God’s kingdom. This Christmas, may we give thanks with a grateful heart.